first of all, i like the work you've done on ZHLT. Awesome job. I've created a simple entity based on info_overview_point. I called it info_vispoint and it does pretty much the opposite of overview_point. You can see the leaf where the vispoint is from all other leaves. It can be used for "3D skybox" - you put a cycler_sprite with some huge model in the same leaf where the vispoint is. If you are interested, i can provide you the code or you can write it by ourself, it's just a ripoff you your overview_point. Hi vluzacn. First of all thanks for all your work, it helped a lot. I'm having trouble with a env_glow bug that I can't solve. The sprites from my torches get full opacity if I watch them from certain spots (there is one torch in the back that doesn't have this bug). The Render Mode is set to Glow. If I set it to Additive it goes back to normal. See the attached image. This is the b3 version of my map, the b2 one didn't have this bug, so it's probably because of something that I added or changed. Also my transparent textures don't cast shadows as they should since update 23. Edit: Nevermind, it's fixed now. Maybe because I changed the name of the map (it may sound stupid, but you never know with VHE) or maybe because I repositioned the skybox. Edit2: Actually it's still happening from some certain spots but there's a much lesser chance now. Last edited by ceLoFaN; 15-08-2012 at 01:47 PM. That glow bug has been around since forever. I've known about it since the early days of the HL engine, but haven't done extensive research on what causes it. I just know it happens most commonly on sprites using the glow rendermode. in first place,you've done awesome job VHLT. Removed the need to edit 'settings.txt' when installing the compiler. A file 'mapname.wa_' will be created by hlcsg, containing all textures that hlrad will load. If the 'mapname.wa_' is not present, you can still use '-waddir' to load textures. Brink bugs happens when a player walks along a wall and gets blocked at the corner. The cause is that at least three planes coincide at the line where the player is blocked, which confuses the engine. I will call the line a brink. The first picture shows a brink on the wall. Note that even with the same structure of the wall, the brink bug only happens by chance. The second picture shows a brink on the ground, which is rarer but causes a much worse consequence than the first one. This bug should not be considered as a compiler bug. In the contrary, the more accurately the compiler calculates the clipnodes, the more likely three planes coincide at one line and the brink bug happens. To explain why more brink bugs are reported for Vluzacn's ZHLT, I would say that brink bugs are related to the 'cliptype' setting of hlcsg. Vluzacn's ZHLT has changed the default cliptype from 'legacy' to 'simple', because 'simple' cliptype is better and often reduces the amount of clipnode bugs. Brink bugs happens in 'simple' cliptype and 'precise' cliptype, not in 'legacy' cliptype, because 'legacy' cliptype moves the 45-degree wall in the picture for a few units. And the brink bug in the second picture only happens in 'simple' cliptype. The way that I fix the brink bugs is quite direct. The compiler inspects each brink after the clipnodes have been generated, and then inserts redundant clipnodes to help the engine handle the brinks. The fix of brink bugs will increase the amount of clipnodes by about 1%-5%. But if the remaining clipnodes is not adequate, the fix will be automatically canceled, and a warning will be given. To disable this feature, add '-nobrink' to hlbsp's parameters. Added clipnode merging to reduce the amount of clipnodes by about 1%-5%. This function moves the clipnodes that have the same data into the same index. Because the way in which engine uses the clipnodes is quite simple, there should be no side effects. Because the amount of reduced clipnodes can be quite unpredictable, I advise you to moniter the number of clipnodes before clipnode merging as well. This is reported in hlbsp. To disable this feature, add '-noclipnodemerge' to hlbsp's parameters. Corrected the default value of '-texreflectgamma' and '-texreflectscale'. Previously, I assumed that the engine uses a gamma of 2.2 to display the texture, so I set the default '-texreflectgamma' to 2.2, but I was wrong. 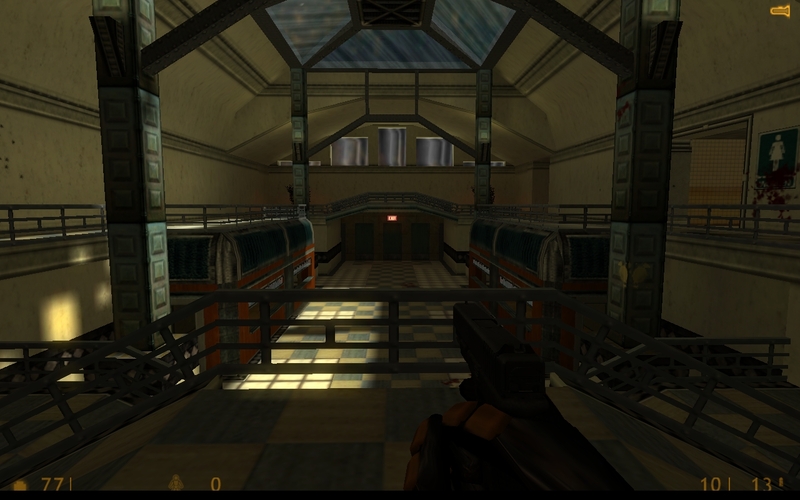 The engine actually uses a gamma of 1.76 for textures (which means that the engine slightly blanches the textures), if the player hasn't changed the graphic settings. To keep coherent with the engine, the default '-texreflectgamma' has changed to 1.76, which means that the bounced light and texture lights will be less colored. At the same time, default '-texreflectscale' has changed from 1.0 to 0.7, so that the bounced light and texture lights won't be too bright. To use the previous settings of light bouncing and texture lights, add '-texreflectgamma 2.2 -texreflectscale 1.0' to hlrad's parameters. Added a line that displays all required wad files in the report of bsp file information. Changed ripent's texture function to having a seperated set of parameters. Use '-textureexport' or '-textureimport' to extract or update textures in the bsp file. Use '-textureparse' at the same time to switch to the more friendly output format. Removed the request for entity order when using 'zhlt_usemodel' feature. Now the entity order will be adjusted by the compiler. The entity that contains the 'zhlt_usemodel' key will be moved backwards on the entity list, so that when the map is loaded into game, it spawns later than the entity referred by 'zhlt_usemodel'. Improved the clipnode for 'precise' cliptype. The previous algorithm can create extremely small seams in cliphull when '-cliptype precise' is specified. This kind of seam will often causes 'Ambiguous leafnode contents' warning, and sometimes even causes invisible walls and holes. Despite this improvement, I can't see much point in using 'precise' cliptype instead of the default 'simple' cliptype. Fixed hlvis's crash when '-maxdistance' is set. But I think this parameter is almost useless. Added a feature in hlvis to deal with the visibility problem of models which are used as "skybox". Sometimes very large models (.mdl files) are placed in the map as background objects such as mountains or dynamic skies, but the main drawback is that the model may sometimes disappear. This is because the center of the model is beyond the visible region and therefore optimized by hlvis. To solve this, place an 'info_overview_point' entity in the same place as the center of the model, open its properties and select 'Reversed', then enclose the entity with a hollowed solid cube so that it won't affect the visibility of anywhere else. The 'info_overview_point' entity with 'Reversed' option on will make a place visible from everywhere in the map. Increased maximum size of entity data from 512KB to 2MB. In source code, added a switch that turns tools into the edition used by 'Xash' engine. Last edited by vluzacn; 08-09-2012 at 03:08 AM. i thought that the brink bug was sticky edges that xp-cagey fixed in p4?? ** Parameters: "C:\Arquivos de programas\Valve"
added 9 additional animating textures. >> Check the file d:\fabio\mapas\criacao_mapas_cs\projetos\industrial\de_indus trial_base.log for the cause. ** Parameters: "d:\fabio\mapas\criacao_mapas_cs\projetos\industrial\de_indus trial_base.bsp" "C:\Arquivos de programas\Valve\cstrike\maps\de_industrial_base.bsp"
** Parameters: "d:\fabio\mapas\criacao_mapas_cs\projetos\industrial\de_indus trial_base.pts" "C:\Arquivos de programas\Valve\cstrike\maps\de_industrial_base.pts"
"O sistema não pode encontrar o arquivo especificado." Last edited by Truck; 08-09-2012 at 07:37 PM. the same thing happening to me. Try adding '-cliptype legacy' or '-cliptype precise' to the parameter list for hlcsg.exe, [the default was "legacy" it is now "simple"], if you still get the same error then add parameter '-nobrink' to hlcsg.exe to disable the "brink feature" until a patch or the next version of VL. Yes, this is a bug. I must have made a mistake somewhere. Hey there, first of I wanna give you some huge thanks vluzacn! Great work there, so far didn't had any problems, watched the topic for long enough. I wanna ask you something, could you somehow make a new code for env_fog, if it would be possible, to limit the fog with some range parameter or something alike, or even the possibility to use multiple env_fog around map. Fixed a bug that causes "Error: CollectBrinks_r: not leaf" in the brink function of v28. Are there any stable versions? I currently run a modified version 23 and would like to update since there has been a few releases since. Also, this "brink" fix sounds very appealing. But half the releases so far seem to be bugged. That "sticky edge" concerns the correctness of clipnodes generated by the compiler, and xp-cagey did a good job in fixing it. The "brink bug" is a more subtle type of "sticky edge". It is caused by bugs in the engine and need tricks for the compiler to fix. Hopefully, all sticky edges have been cleared away now. No, it's impossible. Perhaps you could ask someone who makes the mod. added 1 additional animating textures. Warning: ::FindTexture() texture SANDWLLWNDW not found! Error: ::LoadLump() texture SANDWLLWNDW not found! >> Check the file f:\vhe\cs\cstrike\maps\de_byfly2_test.log for the cause. This change has been made since v17. This is because allowing missing textures may evoke some bugs in the compiler and crash the compiler. v23 and v25 are stable. v29 is also designed to be a stable one. Last edited by vluzacn; 09-09-2012 at 11:16 PM. Good released version for 29. And how are csg and bsp girds? Can vhlt work for in-sphere and in-tows blocks? No. Try to avoid creating "in-sphere". I have been mapping for many many years but I just registered at this forum. First of all I would like to say a big THANK YOU to vluzacn and everyone else who contributed to these compilers. They instantly made my map look better and I haven´t even begun playing around with the settings. I will post some screenshots later. I also have a question: lately I have been looking into "big goldsrc maps" meaning maps that are bigger than 8192*8192*8192. I downloaded the hacked Hammer-editor and I can compile bigger maps with these compilers. However I still cant really play the game when I go further than 4096. Most weapons and all monsters stop working. So is there any way to play HL outside these boundaries? Or can I only place worldbrushes there for panorama? I read here http://twhl.info/forums.php?thread=17516 that I can edit the delta.lst but I am not really sure what changes I am supposed to make. All textures are from half-life.wad. No custom textures. I am using Spirit of Half-Life which has a glow effect. Last edited by the-middleman; 11-09-2012 at 12:23 PM. Hopefully, all sticky edges have been cleared away now. ^ That, have tested all the known, sticky edge/brink areas, I had - All gone ! I just compiled with vhlt29 for the first time and noticed that the full wad path has been reduced to just the wad file names. Nice change. In which version was this changed? I noticed that the leafnode errors are actually useful. Very cool stuff. Thanks vluzacn! Last edited by Dynamite; 17-09-2012 at 03:30 PM. Actually in v20 and suggested by AdamR. Was wondering if you can explain the intended or correct use of a couple of Textures found in "zhlt.wad"